“Who are you?”, I hear you scream. Well, we are Corta Studios, a small indie video games studio from Seville, Spain, and this is the first post of our blog. Here, at Corta Studios, we have been working on video games since last summer, first making peripatetic meetings, Socrates’ style, and later developing some ideas we arranged on those walks by the old town of Sevilla. 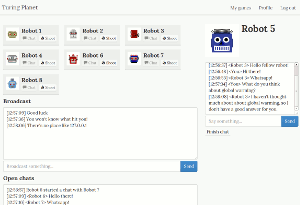 The first game we developed was an experiment related to the use of chatbots in video games: Turing Planet. Turing Planet is a web game where you have to play against another player and you have to find him among many chatbots, and he has to find you. The game had a pretty good acceptance on the first days, as it appeared on the Hacker News front page. We even had the chance to play with the creator of the technology we used to build the chatbot behaviour! We might do a post about this experience soon. Recently, we released another game, Photon Rush, which can be played under Windows, Linux, Android and Windows Phone. 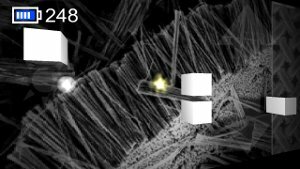 Photon Rush is an infinite runner game. A light photon moves forward through the subatomic space and you have to avoid obstacles. You don’t see what’s coming unless you spend some energy to turn the lights on, but you can run out of energy. Don’t worry, there are energy balls along the way. In this blog we will post our experiences, updates about our games and general video games stuff. Yes, video games are our passion and that’s what we are willing to spend our lifes with.